[By Nick] I don't believe we've ever talked about my feelings toward whoopie pies before on the site. To be blunt, I love them. I mean heck, Turkey Hill's seasonal version was one of the first ice creams Dubba and I ever talked about together. There's just something about that treat that makes them so magical. It still depresses me that I never got to try Ben & Jerry's Makin' Whoopie Pie and every time there's mention of a flavor being resurrected, I have hope that I'll be seeing that flavor returning to the shelves. With that said, when I saw Hood's new version I knew I had to grab it. Just look at the picture and read the description. The ice cream looks like it's an actual whoopie pie with the creme flavored middle ice cream. I feel like we might be seeing a trend here since Friendly's used the same approach with their Ice Cream Cake ice cream. I for one welcome this trend with open arms. Okay, enough with me rambling let's get straight to the ice cream. I have to apologized for the lack of an opening shot. I was too excited/hungry that I dove straight in. Thankfully the scooped shot looks similar to what you see on the package as well as when you open it. Let's start with the bases first. The chocolate ice cream is one of the better ones I've had. It's milk chocolate like and kind of reminds me of a rich chocolate milkshake. It also has a bit of a cakey vibe to it which is pretty awesome. The creme ice cream is the big winner here though. It tastes exactly like the filling of a whoopie pie! There's a bit of marshmallow like quality as well in the flavor and texture which I enjoyed a lot. The change in texture from base to base is as Dubba would say a great "fun factor". The ratio of chocolate to creme is spot on. Even with their obviously being more chocolate, it in no way overpowers the creme base. When scooped together, there's an eerily familiar flavor going on. It took me awhile to figure it out, but this ice cream reminds me of the Rocky Road Klondike Bars (which was the product that started mine and Dubba's friendship) Those bars remind me of a chocolate covered marshmallow and that's exactly what's going on here. Well a chocolate covered marshmallow with chocolate cake chunks. While I'd be hard pressed to tell if they're actually whoopie pie pieces or just traditional chocolate cake chunks, they're inclusion brings this flavor together as a whole. Their cocoa presence works well with the sweet bases and they add for a nice textural contrast as well. Now does this beat Turkey Hill's version? I'd say yes. 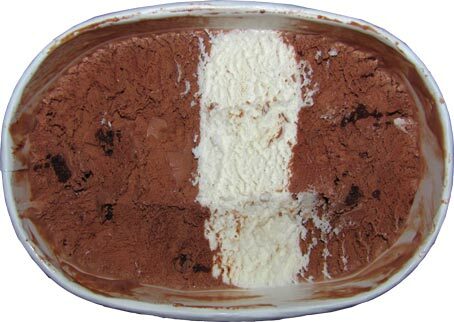 The uniqueness of the creme flavored ice cream is better than the swirl that Turkey Hill uses. You're getting more of a whoopie pie experience with Hood than you do with Turkey Hill. 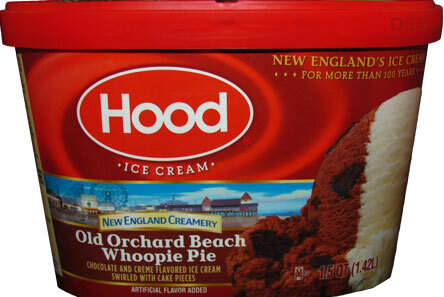 That and Hood's version is available year round for whenever those craving occur! I always find it strange how a lot of generic companies usually contain the same starting ingredients of milkfat and nonfat milk for creating ice cream. 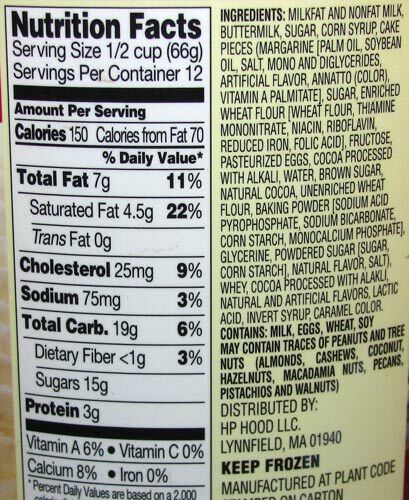 Stride, I think it's easier to put them together just so they can have an easier way of listing them in the ingredients list. Since they list by the amount, I'm sure it would be easier to put them together instead of listing them separate.